First up from the people I asked to guest blog for me is Courtney from Polished Lifting.. I came accross her some time ago and immediately fell in love with her pictures/nails! She has a very elegant way about her that totally captured my admiration and heart. Here is her guest post I hope you fall in love with her too! Hey guys! I’m Courtney from Polished Lifting, and I will be subbing in for Monica today. When she asked me to do a guest post I pretty much fell over dead. I’ve obviously recovered, but I was overjoyed at the opportunity. 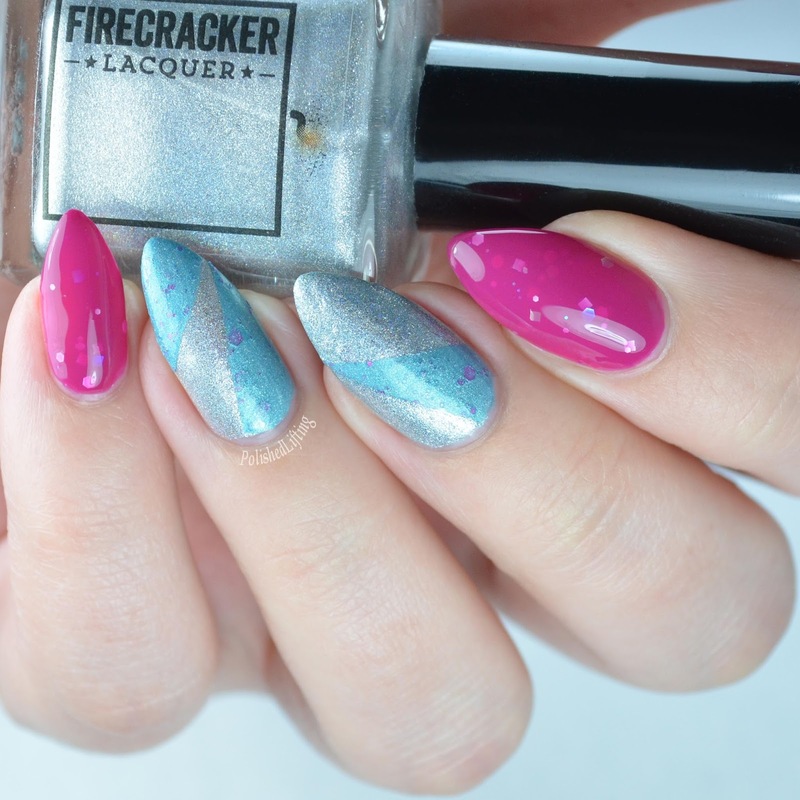 Today I have a nail art look I created with a few of my favorite Firecracker Lacquer shades and some Vinyl Quickies nail vinyls. I started with a base of Dragons Can Be Pink Too (thumb, index, pinky), Santa’s Summer Stockings (middle), and The Power of the Horn (ring). Once that had an opportunity to dry, I applied “v” shaped vinyls to my middle and ring fingers. I applied a quick, thick coat of polish over the vinyls and then pulled them away before the polish had a chance to dry. After a few minutes of drying, I topped it all off with a quick dry top coat.The look is pretty easy unless you are a super klutz like me. A tip for the wise: don’t apply nail vinyls over polish until it is completely dry. Know that this can take at least an hour. If you are patient you will have no issues with pulling it off. 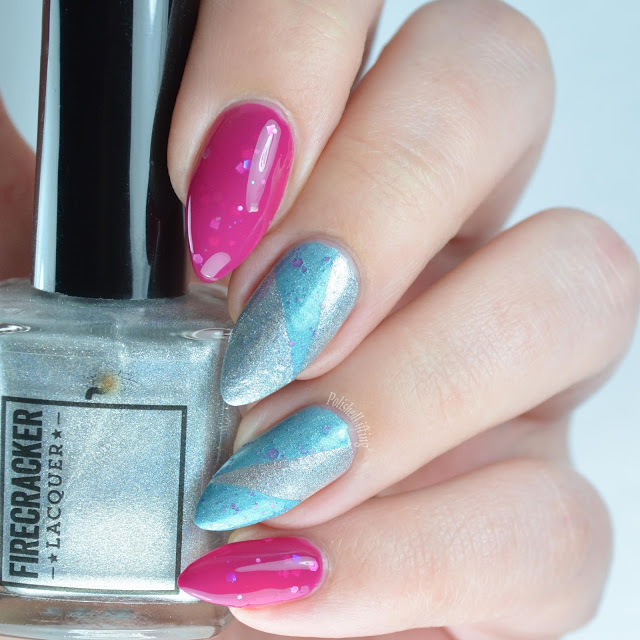 Firecracker Lacquer– Santa’s Summer Stockings, The Power of the Horn, Dragons Can Be Pink Too! I just wanted to take a moment to say thank you for having me. I hope you all have a wonderful rest of your week! Thank you soooo much Courtney for helping me out!! I really appreciate it!! You can follow Courtney on Social Media through the links below! Do it!! This is a beautiful mani! I can’t wait to see all of your upcoming guest posts! Thank you again for having me! I hope you have a speedy recovery.